If you’ve been hanging around here on Needle ‘n Thread for a few months, you might remember that, shortly after Christmas, I mentioned that Benton & Johnson in the UK was having a sale on their website, particularly on their goldwork embroidery kits (which are still marked down, by the way). I purchased a few of them at the time so I could review them for you. Gosh, I just love using you as an excuse to feed my embroidery habit! 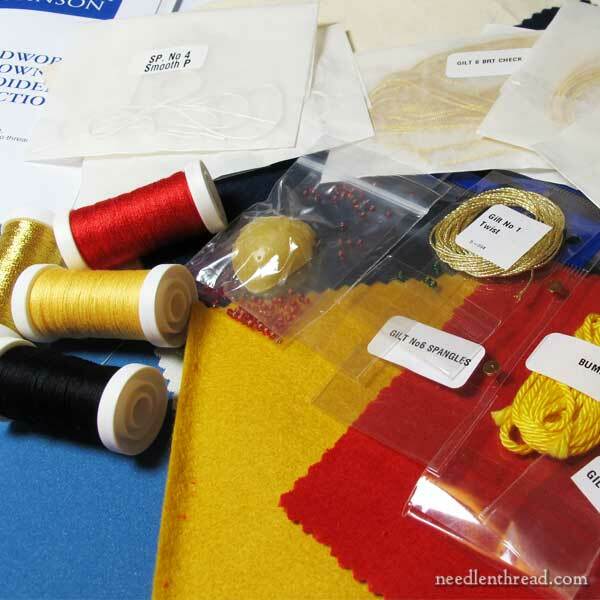 Just in case you’re looking for goldwork kits suitable for beginners and beyond, it’s nice to know what you’ll get when you order an embroidery kit. The descriptions on the Benton & Johnson website are not very thorough, so I was curious to see what their kits are like. When you open the kit up, you’re met with an instructional booklet, into which all the supplies for the project are tucked up nice and snuggly. 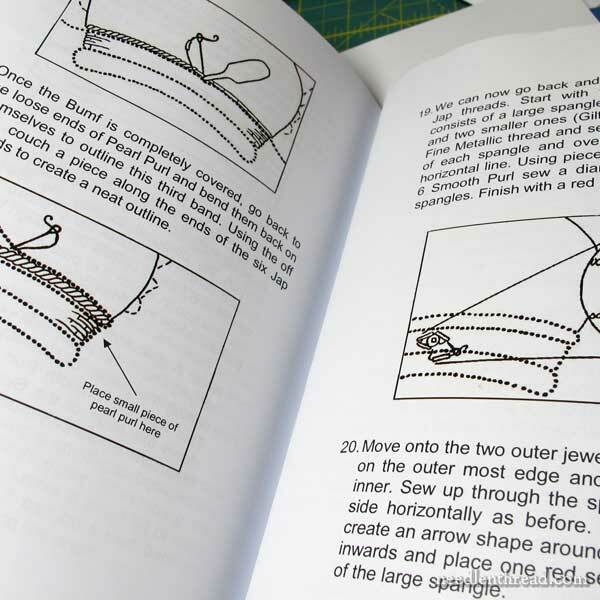 In the Benton & Johnson kits, the instructions are all drawn diagrams with explanatory text. The diagrams are clear, and the text is easy to follow. So, besides the initial image of the finished design on the cover, don’t expect photos of the piece in progress or finished. All the instruction is done through drawn diagrams. And then, of course, there’s the Stuff! Everything you need to complete the kit is included – the backing fabric, the ground fabric, the felt padding, the red velveteen, the spooled couching and sewing threads in various colors, a wee beeswax strawberry, the string padding (or bumf) for underneath the purls, all the goldwork threads, the beads, and the spangles. It’s all there! And, for most of the supplies, there’s more than enough to work the kit – or at least, there’s a little wiggle room. What you need to supply: a frame for framing up the project, scissors (for metal threads and regular threads), and needles. The ornament goldwork kits are quite good for beginners. They have everything you need to complete the ornament, and the instructions are clear and precise. The techniques are simple goldwork techniques that are accessible and easy. So, that’s what you’ll find in the Benton & Johnson goldwork kits from the UK. 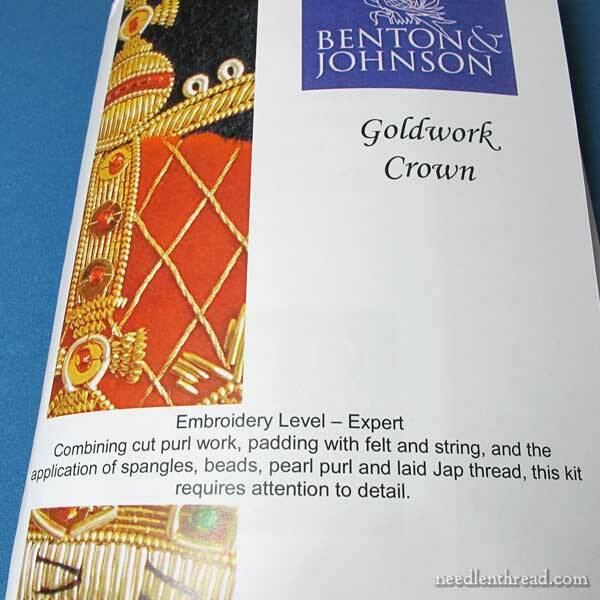 The biggest drawback for US embroiderers interested in goldwork kits from Benton & Johnson is the shipping. I’ll show you some of their metal threads a little later on, and discuss how you can reduce the sting of the shipping costs, at least a little bit. Update, 2019: If you’re looking for products by Benton & Johnson, check out the Toye, Kenning & Spencer website, where Benton & Johnson goldwork products (only threads, from what I can tell) are listed, here. What about you? Have you tried any of the kits from Benton & Johnson? Do you have any questions, or are you’re curious about any particular point about the kits? Feel free to leave a comment below! December 3, 2014 Lorna Bateman Embroidered Pincushion – Winner! Thanks Charles. I also found this one after watching and it’s in English and I think a bit more comprehensive. Hope the link works. How long did it take for you to receive your kit? I ordered a number of kits within a few days of your first description of their offerings and have yet to see any. Hi, Denise – oh, they’ll show up soon. It took a little longer than I thought it would – I placed the order before I wrote that first mention and it was a good three weeks, I think, before they arrived. I think they put together the kits as they receive orders. Hmmm. I didn’t run into that. I just used my “overseas purchases” credit card (my debit card doesn’t work outside the US), and didn’t have any problems. I just went through the regular checkout process. I love your reviews, Mary. Thanks for taking on extra kits for the team! What is the US cost of a kit with shipping? Hi, Cheryl – depends on the kit and the current exchange rate. Normally, when I’m checking prices, I add the items to the cart, fill out the shipping info, and then do a currency conversion (there are plenty of online currency conversion tools) to check the U.S. dollar equivalent. I remember you reviewing these kits. 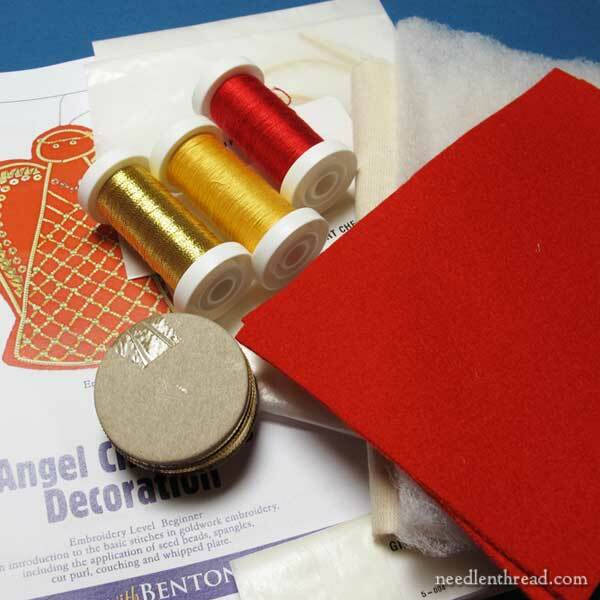 The above kits look very interesting and I really like the goldwork Angel and nice to know it’s for beginners. I look forward to your review when you start embroidering the kits especially your views on the instructions drawn instructions. The Angel would make a lovely Christmas decoration for a Christmas tree. It’s good to know that these are available in the UK so the postal costs would not be so expensive for me. Thanks for reviewing these goldwork kits and I look forward to you sharing your progress on them. I was glad to see this post. The only item I’ve ordered from England was via the RSN. Even though it was a ‘sit-on’ frame w hoops the shipping via Royal mail wasn’t too excessive, however it was a year ago. I’m looking forward on your follow-up to this article on how to slim-down shipping costs! In the crown shown, there looks to be numerous areas where the gold is cut in equal lengths for filling and the little curls around the top. Do they give any special instructions on how to cut them very exactly ? What is the trick to this? I usually mark a measurement on my cutting board (I have a little velveteen cutting board). i cut the first one and try it – if it’s the right size, I mark the measurement on my little board, and then I cut the others to that size. Thank you so much for the details about these kits. I looked at the site after your last mention of them but was hesitant because of the lack of information. I am anxious to try some goldwork and will feel more confident ordering from this provider. Your reviews are the best! Thanks Mary. I am always enthused after reading your comments! I would like to know if the golden thread the kits provide is better to work than the usual metalic ones. Does it ‘break’ easily as the other, or is it more resistant? Real metal threads are vastly different from metallic threads. They don’t break and fray, but for the most part, they are not sewn through the fabric. They are sewn into the fabric. There are some real metal threads that can be sewn with, with certain stitches, but for the most part, they are couched on or cut and sewn on like beads. It’s not just American stitchers facing hefty shipping costs. I live in Australia and the cost of shipping is more than the cost of a kit!! True, Susannah -shipping costs anywhere outside of the UK, from fhe UK, are pretty hefty! Metal and metallic threads are the bane of my existence! After years of struggling with them, I’ve accepted that, for whatever reason, I will never be able to adequately work with them…and that’s okay, because I can admire everyone else’s work! (And, with SOME projects, I can get away with faking it with fine, metallic-colored ribbon.) So, I will get back to work on my current project, which uses good ol’ floche, and ooh and aah when you post pictures of your goldwork! I live in the UK and recommend Benton and Johnson without reservation. They hand make very high quality products which are a joy to use. I find they know their market very well and are always working on new designs, for example silk covered wires in the richest colours. Mary, thank you for ordering from this site & exploring their wares for us! I’ve been wishing for the Thistle kit (just like Carol from MN) for quite awhile. I just can’t bring myself to place an order until they finish this “under construction” site – I first came across it a year & a half ago. At least it’s improved since your last review! Since shipping costs are more than the price of the Thistle kit I would like to make the order worth while by adding other pieces. Being completely untried in goldwork would you explain a couple of the ‘threads’? What is 1) Gilt On 40/2 Cotton Tambour? and 2) Gold 2% 8×2? Thanks so much! My comment is- I followed your tudor rose project and ordered all the goldwork supplies from Hedgehog, they are all in a nice plastic box marked goldwork and there they are…… now all I have to do is find the directions for the tudor rose somewhere on your website!! How the projects pile up. Now I know why when one of my sewing friends dies, I end up with so many nice kits and unfinished projects. Goldwork- hum I must get on that one. Hi Mary, just tried to look at their beautiful goldwork products but gave up as each page seems to have a huge purple logo that takes ages to download. I’d love to see what they have but trying to do so is r-e-a-l-l-y frustrating. Although I have not ordered a kit from Benton & Johnson, about 4 years ago I had an opportunity to visit and tour one the manufacturing sites. It was fascinating. My introduction to metal threads and gold work! Learning about the history, manufacturing details, seeing the dedication and pride of the personnel and of course the beautiful products – all of it was breathtaking and amazing! So cool that gold work and embellishment is experiencing a bit of a rennaisance today! I look forward to hearing more about the kits from you. Thanks for sharing! Bumf?! I always thought that meant tedious, unimportant and uninteresting. I had no idea it was a real thing used in needlework. Please! Mary, show us what real bumf looks like and how it’s used. Pretty please? without a picture on the website. Same with me, Hannah – I am curious about that one, because it sounds fun, but without a picture of what it looks like, not so sure I’d spring for it…. I’ like to order metal threads from Benton & Johnson as it’s excellent quality product and one of the best supplier in EU ; living in France I guess it’s OK for the shipping cost, it would not be so expensive ; the main drawback for me is their website : it’s really not well done at all, very difficult to find what you nedd and in many case, there’s no picture to show the product ; there’s also not really comprehensive explanation for many of the products they sell. And also very long to upload !! Besides, I’m not so excited by the designs of their goldwork kits. Anyway, thank you for this interesting reviex as well as for all your articles. What are goldwork threads made of? Do they have real gold in them or are they just metallic threads? Must they have real gold in them to be considered goldwork? Are there good sources for the goldwork materials without having to buy a kit?? Yes, most of them have some quantity of real gold in them. They are made all different ways. This glossary of real metal threads on Tanja Berlin’s website is very helpful: https://www.needlenthread.com/2015/03/scrap-fabric-stitch-photo-sessions.html If you are in the US, Hedgehog Handworks has a very good selection of real metal threads. If you’re in Canada, Tanja Berlin has a great selection. In the UK, there’s Benton & Johnson, Golden Hinde, and Golden Threads. In Australia, there’s Alison Cole’s website – she has an excellent selection. I love these kits! I have had my eye on them for a while. Have to admit that I was put off by the shipping. I have ordered things from Europe before, and never run into rates this high. I am quite horrified to see a word ‘Jap’ used so casually here on the cover of the kit. Maybe Benton&Johnson are not aware, but it’s a slang of racially derogatory nature. If anyone is equally unaware, I’d suggest googling of the term. Then you’ll see what I mean. Thanks for expressing your dismay, Iz. Of course, in context, there is nothing derogatory being said here. The thread has been called that ever since it was first produced, long before any derogatory association was made. Mary do you have anything on Sashiko? hands do not take to this media. I think now that I am older I should try again and if it still does not work for me, I can say its “old age”. We had our exhibition on Saturday and my Hungarian Redwork sure made a splash. I think what impressed most was that the whole project was presented on line and I was amazed at the number of ladies who actually read your newsletter every day. It made me feel really part of a family of stitchers. seen all sort but even I have never seen anything like it. It seems to be an ancient tambour or something of that sort. The other one is a French “L’Etoile Brodeuse” and contains light steel “templets”, Valet razor blades and some large needles. I am going to try to get them to you if you would be interested. It would be lovely to know just what we have here and how old. Hi, Ena – You’re welcome to send photos if you’d like! I’m not an expert on needlework tools, antiques, and the like, but I’d love to see the tools. They sound interesting! So glad your runner went over well! That’s very exciting! I’m still plugging away on mine…. I love your website and have been reading it pretty regularly for a while now. I am particularly interested in your articles about teaching young people. I thought that you might like to know that I have been teaching young people goldwork. They love it! We have completed a number of projects and have won ribbons at the County Fair, of course…because they are so gorgeous. I am taking a certificate of technical hand embroidery with the Royal School of Needlework in San Francisco and I fell in love with goldwork. I teach many children embroidery, I have over 100 students at the moment….they are working on sampler stitching like their counterparts in the 19th century. Goldwork and children is a wonderful embroidery adventure. Hi, I just updated the link info in the article, adding a link to Benton & Johnson at the end of the article. It looks like they are only offering metal threads at this point – I did not see any kits available. Thanks for your comment!